Russian diplomats are working to prepare a lawsuit against the United States in connection with the seizure of Russia’s diplomatic property in Washington and San Francisco. “We have a direct instruction from the President of the Russian Federation Vladimir Putin , we are working on the implementation of this commission,” the Russian ambassador to Washington Anatoly Antonov ..
At the same time, he noted that this is a complex issue and needs to be studied. 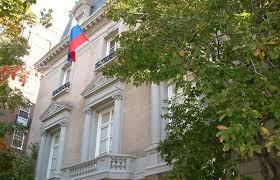 On September 2, the US authorities closed the Russian Consulate General in San Francisco, a trade mission in Washington – these buildings are in the state property of Russia and possess diplomatic immunity. In addition, the branch office in New York was closed (this building is leased by Moscow). In Russia, these actions were viewed as a hostile act and urged the US authorities to immediately return the property into possession. Later, Russian President Vladimir Putin instructed the Foreign Ministry to appeal to the American court.